Chuck Firth of Batavia, IL, loves cats. How much, you ask? Dissatisfied with the quality of pooper-scoopers on the market, Chuck set out create his own super-scooper: The Durascoop Original. Unfortunately, more than 2,100 miles away, opportunistic plaintiffs’ lawyers were using an obscure law — California’s Proposition 65 — to file abusive lawsuits that threaten the future of the Durascoop. “Prop 65” requires that any consumer products that contain any one of 800 different chemicals to include a warning label. Because many of these chemicals can be found in a wide array of common, everyday, household products, the failure to properly label and meet requirements of Prop 65 has created a cottage industry for a handful of plaintiffs’ lawyers. 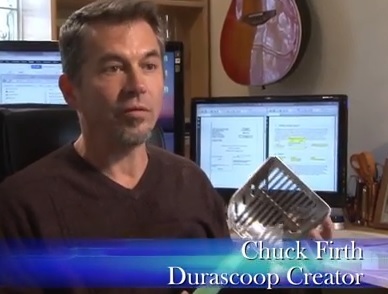 Under Prop 65, the plastic handle on Chuck’s Durascoop needed a warning label. So, lawyers filed lawsuits that may have the impact of forcing Chuck to shut his doors, taking the popular Durascoop off the market for good. 1) It Might Destroy an Innovative American Business. “Owing my own business really was a dream come true,” according to Chuck. But now, lawsuit abuse is turning that dream into a nightmare and could force Chuck to close his doors for good. One less American business. Less Durascoops. More cat poop. Cat lovers found the Durascoop Original to be the cat’s meow and it became the most popular pooper-scooper on the market. These cat owners may soon be out of luck, however, thanks to plaintiffs’ attorneys who, according to Chuck, are “skimming off the backs” of innovators like him. Like cats to catnip, California lawyers were drawn to the money-making possibilities created by Prop 65. In 2011 alone there were 338 settlements in Prop 65 cases, totaling more than $16 million dollars. Who got the majority of this fancy feast of cash? Plaintiff’s lawyers, of course, taking home about 75% of the settlement money. If it sounds like something smells, it’s what the Durascoop scoops. Crossposted from The Faces of Lawsuit Abuse website.